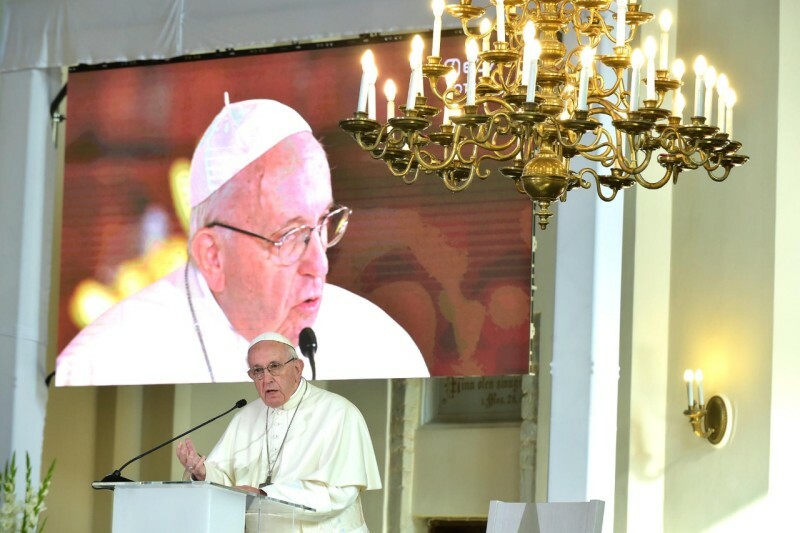 Following is the full text of the remarks by Pope Francis during his September 25, 2018, Ecumenical Meeting with young people, in the Kaarli Lutheran Church, Tallinn. Thank you for your warm welcome, for your songs and for the testimonies of Lisbel, Tauri and Mirko. I am grateful to the Archbishop of the Estonian Evangelical Lutheran Church, Urmas Viilma, for his kind words of welcome, and for the presence of Archbishop Andres Põder, President of the Estonian Council of Churches, of Bishop Philippe Jourdan, Apostolic Administrator in Estonia, and of the other representatives from the different Christian confessions present in the country. I am also grateful for the presence of Madam President of the Republic. It is always good to meet, to share our life stories, and to share with one another our thoughts and hopes; it is wonderful, too, for us to come together as believers in Jesus Christ. These meetings bring to fulfillment that dream of Jesus at the Last Supper: “That they may all be one, […] so that the world may believe” (Jn 17:21). If we try to see ourselves as pilgrims journeying together, we will learn how to entrust our heart to our traveling companions without fear and distrust, looking only to what we all truly seek: peace in the presence of the one God. Just as crafting peace is an art, so too, learning to trust one another is also an art and a source of happiness: “Blessed are the peacemakers” (Mt 5:9). And we do not go on this road, on this path only with believers, but with all. All have something to say to us. We have something to say to all. The great painting in the apse of this church contains a phrase from the Gospel of Saint Matthew: “Come to me, all who labor and are heavy laden, and I will give you rest” (Mt 11:28). You, as young Christians, can identify with some elements in this passage of the Gospel. In the preceding narrations, Matthew tells us that Jesus is accumulating disappointments. First He laments because it seems that those who heard Him simply did not understand what He was trying to say (cf. Mt 11:16-19). Frequently you too, as young people, can feel that the adults around you do not appreciate your hopes and desires; sometimes, when they see you very happy, they get suspicious; and if they see you anxious about something, they downplay it. In the consultation prior to the forthcoming Synod, in which we will reflect on young people, many of you expressed the desire to have a companion along the way, someone who can understand you without judging and can listen to you as well as respond to your questions (cf. Synod on Young People, Instrumentum Laboris, 132). Our Christian Churches – and I would dare say this of every institutionally structured religious process – at times bring attitudes that make it easier for us to talk, give advice, speak from our own experience, rather than listen, rather than be challenged and learn from what you are experiencing. Many times Christian communities close themselves, without realizing it, and do not listen to your anxieties. We know that you want and expect “to be accompanied not by an unbending judge, or by a fearful and hyper-protective parent who generates dependence, but by someone who is not afraid of his weakness and is able to make the treasure shine that, like an earthen vessel, it holds within (cf. 2 Cor 4:7)” (ibid., 142). Today, I am here to tell you that we want to mourn with you when you mourn, to accompany your joys with our applause and our laughter, and to help you to be followers of the Lord. You, boys and girls, young people, know this: when a Christian community is truly Christian, it does not engage in proselytism. It only listens, welcomes, accompanies and walks, but does not impose anything. Jesus also complains about the cities He visited, where he worked great miracles and demonstrated signs of great tenderness and closeness, and He deplores their inability to see that the change He came to bring was urgent and not to be delayed. He even says that they are more stubborn and obdurate than Sodom (cf. Mt 11:20-24). When we adults refuse to acknowledge some evident reality, you tell us frankly: “Can’t you see this?” Some of you who are a bit more forthright might even say to us: “Don’t you see that nobody is listening to you anymore, or believes you?” We ourselves need truly to be converted; we have to realize that in order to stand by your side we need to change many situations that, in the end, put you off. We know – as you have told us – that many young people do not turn to us for anything because they don’t feel we have anything meaningful to say to them for their existence. This is awful. When a Church, a community, behaves in such a way that young people think: “They won’t say anything to me that will help me in my life.” In fact, some of them expressly ask us to leave them alone, because they feel the Church’s presence as bothersome or even irritating. And this is true. They are upset by sexual and economic scandals that do not meet with clear condemnation, by our unpreparedness or simply the passive role we assign them (cf. Synod on Young People, Instrumentum Laboris, 66). These are just a few of your complaints. We want to respond to them; as you yourselves put it, we want to be a “transparent, welcoming, honest, inviting, communicative, accessible, joyful and interactive community” (ibid. 67), namely, a community without fear. Fears close us. Fear drives us to be proselytes. And fraternity is something else: an open heart and fraternal embrace. Before coming to the evangelical text that dominates this church, Jesus breaks out in praise of the Father. He does so because He realizes that those who did understand, who did grasp the meaning of His message and his person, are the little ones, those that have a simple, open mind. Seeing all of you like this, gathered as one and singing together, I add my own voice to that of Jesus and I marvel that, for all our lack of witness, you continue to discover Jesus in the heart of our communities. Because we know that where Jesus is, there is always renewal; there are always new opportunities for conversion and for leaving behind everything that separates us from Him and from our brothers. Where Jesus is, life always has the flavor of the Holy Spirit. You, here today, reflect something of the marvel that Jesus felt. So yes, let us repeat His words: “Come to me, all who labor and are heavy laden, and I will give you rest (Mt 11:28). But let us say them in the conviction that, beyond all our limitations and divisions, Jesus is still the reason for our being here. We know no greater peace of mind can be found than by letting Jesus carry our burdens. We also know that many people still do not know Him and live in sadness and loss. One of your famous singers, about ten years ago, said about one of her songs: “Love is dead, love has gone, love no longer lives here” (Kerli Koiv, Love is dead). No, please! Let us make love be alive, and we must all do this! And there are so many who have this experience: they see that the love of their parents ends, that the love of newlyweds dissolves; they feel profound pain when no one cares that they must emigrate to look for work or when they are regarded with suspicion because they are foreigners. It might seem that love is dead, as Kerli Koiv said, but we know that it is not and that we have a word to say, a message to bring, with few words and many actions, for you are the generation of images, the generation of action, more than speculation and theory. And that is how Jesus likes it because He went about doing good, and when dying He preferred the striking message of the crossover mere words. We are united by our faith in Jesus, and He is waiting for us to bring Him to all those young people whose lives are no longer meaningful. And the risk is, also for us t0 believe, to lose the meaning of life. And this happens when we believers are inconsistent. Let us accept together that newness that God brings to our life, that newness that impels us to set out anew to all those places where humanity is most wounded. Wherever men and women, beneath the appearance of a shallow conformity, continue to seek an answer to the question of life’s meaning. Yet we will never go alone: God comes with us; “He is unafraid of the fringes, He himself became a fringe (cf. Phil 2:6-8; Jn 1:14). If we have the courage to go out of ourselves, of our egoism, of our closed ideas and go to the fringes, we will find Him there, because Jesus precedes us in the life of a suffering and discarded brother. He is already there (cf. Apostolic Exhortation Gaudete et Exsultate, 135). Boys and girls, love is not dead. It calls us and sends us forth. It only asks that we open our heart. Let us ask for the apostolic strength to bring the Gospel to others – but to offer it, not impose it — and to resist the tendency to see our Christian life as if it were a museum of memories. The Christian life is life, is future, is hope! It’s not a museum. May the Holy Spirit help us to contemplate history in the light of the risen Jesus, so that the Church, so that our Churches will be able to continue to go forward welcoming in them the Lord’s surprises (cf. ibid, 139), recovering their youthfulness, the joy, and beauty of which Mirko spoke, of the Bride that goes to meet the Lord – the Lord’s surprises. The Lord surprises us because life surprises us always. Let us go forward, to meet these surprises. Thank you!